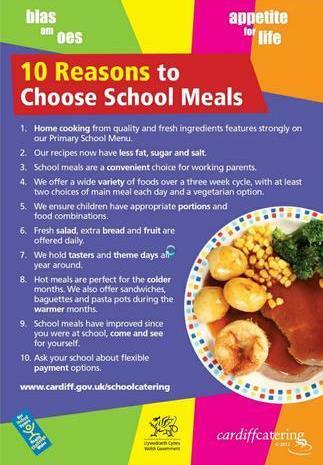 Cardiff Council catering are pleased to introduce their new menus. The cost of a meal is now £2.30 per day or £11.50 for the week. The menu operates on a three week cycle to ensure that children receive a varied diet, and there is a vegetarian choice available each day. Please remember dinner money should always be paid in advance and sent in to school on a Monday morning. Please ensure the correct money is enclosed in an envelope and marked with your child’s name and class. We are a healthy school and therefore encourage a healthy lunch box. We discourage salty or sugary food and fizzy, sugary drinks, both of which are unhealthy for children.